The Fort Scott High School Forensics team competed in Chanute on Friday and Saturday as well as in Lawrence on Saturday. 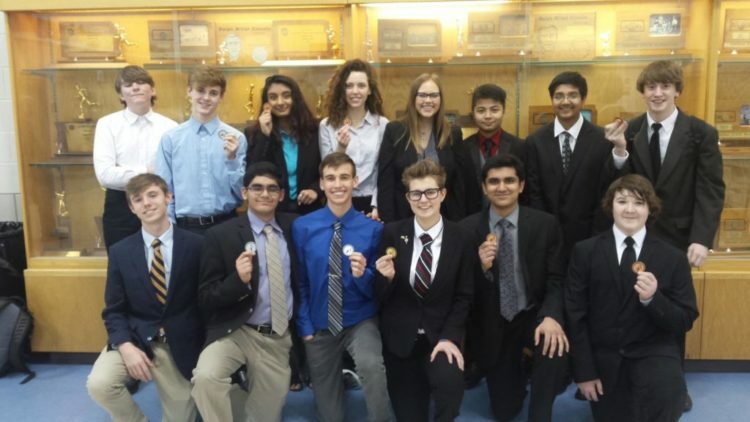 On Friday night at Chanute, in Congress, Lincoln Douglas, and Public Forum Debate: Thade Yates placed 5th in Novice House, Neil Gugnani placed 2nd in Novice house, Jacob Ham and Zach Mundhenke placed 5th in PFD, Audra McFarland and Karina Kantilal placed 3rd in PFD, Grant Feagins and Shekhar Gugnani placed 2nd in PFD, Mark Adams placed 2nd in LD and Rebekah Sweyko placed 1st in Open house. International Extemp: Novice Shekhar Gugnani takes 5th place! At Lawrence High School on Saturday, in Poetry: Placing second and qualifying for state was Brooklyn Lyons and placing first and qualifying for state was Elizabeth Ngatia. In Prose: Placing first and qualifying for state was Brooklyn Lyons. Original Oration: Placing first and qualifying to state was Elizabeth Ngatia. In Program of Oral Interpretation: Placing second was Karina Kantilal. Finally, in Domestic Exempt and Impromptu Placing first and qualifying for state in both is Mark Adams. We had an outstanding first weekend out, and we look forward to improving even more as the year progresses.